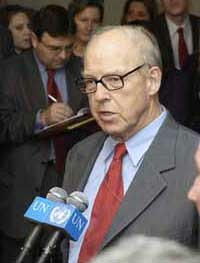 Quidnovi: Hans Blix: Is US sending out the wrong signal? Who are we fooling here? Nuclear weapons have been scratched off the list a long time ago already. Chemical weapons? Biological weapons? None, so far, have been used. Have we found any, yet? Rumors abound. Chances are that we might still find some traces of them---though probably not in any significant amount if we do, and certainly not anything that would amount to the evidence of the "grave and gathering" threat of which it was question before the war started. But what does it matter now, whether we find some or not? We now all know that it was all false pretense. The cat is out of the bag. We are there for REGIME CHANGE (and darn proud of it, too.) That's what this has always been about. And Iraq is just the tip of the iceberg. Hans Blix: Is US sending out the wrong signal? The invasion of Iraq was planned a long time in advance, and the United States and Britain are not primarily concerned with finding any banned weapons of mass destruction, the chief UN weapons inspector, Hans Blix, said in an interview on Wednesday. "There is evidence that this war was planned well in advance. Sometimes this raises doubts about their attitude to the (weapons) inspections," Blix told Spanish daily El Pais. "I now believe that finding weapons of mass destruction has been relegated, I would say, to fourth place, which is why the United States and Britain are now waging war on Iraq. Today the main aim is to change the dictatorial regime of Saddam Hussein," he said, according to the Spanish text of the interview. Blix said US President George W Bush had told him in October 2002 that he backed the UN's work to verify US and British claims that Baghdad was developing biological, chemical and nuclear weapons. But he said he knew at the time "there were people within the Bush administration who were skeptical and who were working on engineering regime change". By the start of March the hawks in both Washington and London were getting impatient, he added. Blix said that he thought the US might initially have believed Iraq possessed weapons of mass destruction---although its "fabrication" of evidence raised doubts about even that---but that Washington was now less convinced by its own claims. "I think the Americans started the war thinking there were some. I think they now believe less in that possibility. But I don't know---you ask yourself a lot of questions when you see the things they did to try and demonstrate that the Iraqis had nuclear weapons, like the fake contract with Niger," he explained. That was a reference to US allegations---later denied---that Iraq had sought to purchase uranium from the west African state of Niger. "I'm very curious to see if they do find any (weapons)," he said. Blix said the war, which on Wednesday entered its 21st day, was "a very high price to pay in terms of human lives and the destruction of a country" when the threat of weapons proliferation could have been contained by UN inspections. By attacking Iraq, Washington had sent the wrong message---that if a country did not possess biological, chemical or nuclear weapons, it risked being attacked. "The United States maintains that the war on Iraq is designed to send a signal to other countries to keep away from weapons of mass destruction. But people are getting a different message. Take the announcement North Korea has just made. It's tantamount to saying 'if you let in the inspectors, like Iraq did, you get attacked'. North Korea accused the United States last Sunday of using a UN Security Council discussion of its nuclear program as a "prelude to war" and warned that it would fully mobilize and strengthen its forces. "It's an important problem," Blix continued. "If a country perceives that its security is guaranteed, it won't need to consider weapons of mass destruction. This security guarantee is the first line of defense against the proliferation of weapons of mass destruction." The 74-year-old Swede announced in March that he would step down from his post when his contract runs out in June. Blix's reputation for independence and resisting political pressure was sorely tested as the Iraq crisis unfolded and US officials became exasperated with his measured reports on Iraqi cooperation with his inspection teams. I really like how this man has stood up and spoken out! It was never about weapons as we all know. Loud clapping for the Hans. 14 Apr 2003 @ 06:55 by jstarrs : Sure it's about weapons, Martha! They just zipped over to Syria, that's all! "Disarmament experts do not give the claim much credence. After all, any suspicious convoy or mobile laboratory would almost certainly be spotted by US planes or spy satellites and bombed long before it reached Syria. But the notion does provide the hawks in Washington with a compelling plot device not unlike the McGuffin factor in Alfred Hitchcock's films---a catalyst that may or may not have significance in itself but that gets the suspense going and keeps the story rolling. I also clap for the Hans. Easy to understand how his "measured" approach made some of our boys in D.C. impatient. Afterall, "measured" might almost be taken to mean "sane" or "patient". Such an approach really frustrates SOME officials I can think of... one of them is named after a plant. weapons of mass distruction starry. Francis, you are talking toooo loud about syria. If the republicians have a hint that the french won't back a syria move then off we go to liberate. Keep that accent down (of course I'm assuming you have a french accent). 14 Apr 2003 @ 11:00 by shawa : Which one is Martha ? Anyway, just food for thought---one thought a day, keeps the dream alive, right? "The face of America has changedwe are now home to persons from every continent and island on the face of the Earth. King once laid out this challenge: We must learn to live together as brothers, or we will all perish as fools. " "Immigrants, if we think about it, are the ideal Americans." 15 Apr 2003 @ 00:58 by finny : Thank you Quidnovi! Yes I read this today in my stack of emails. Jstarrs your just jesting are you not? Shakti_ma you poke fun, that's in poor taste you wanton wench. I'm just appalled at the US's blantant disregard for humanity outside of the fabulous USA. Why did I turn on the TV this morning and hear that bushy is now accussing syria of weapons of mass distruction. I need a drink and I just got up. Now another round of posturing by the US of A and Syria. Since we have forces their already and are ALSO still in afghanistan...damn my head hurts now. Need a balm. Between the US of A directing the world and having the same stuff here on NCN is scarry. Lots of fighting and EGO's. At least here on NCN forgiveness can sometimes appear. (for those what want to heal and not point fingers). Whatever little muslim country doesn't go along with the program (sweat shops), Cheney's gang of billionaires will find a reason to bomb them to bits. When there's drastic economic disparities between various regions, the billionaires can rake in billions for a small investment in oil machinery, and also setting up factories to make trinkets that cost pennies because of the slave labor, then ship them to Europe and the U.S. selling them for $20 or more. This is nothing new, it's been going on for decades. As they use up the natural resources of South and Central America, and Africa, and Asia, they need easy (cheap) access to other resources. The problem is most *muslim countries* won't let the capitalists in, so that's why the billionaires ask Cheney to liberate them. To imagine that health, happiness, well-being and feelings are irrelevant is the true sign of a primitive people.